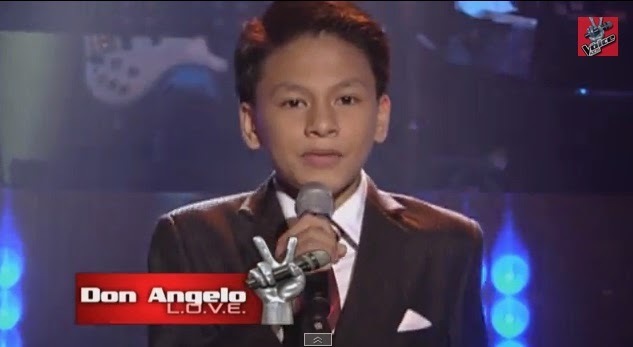 Manila, Philippines - Don Angelo Santos performed Michael Buble's hit song "L-O-V-E" during the blind auditions of ABS-CBN's top-rating singing reality show aired on Saturday, June 14, 2014. Don Angelo picked Team Sarah. As of the June 14 episode, 39 artists have already convinced with at least one coach to turn around, 14 hopefuls getting a slot in Team Lea, 13 in Team Sarah and 12 artists on Team Bamboo. The Saturday's episode of 'The Voice Kids' dominates online conversations with '#VoiceKidsABSCBN', 'Eufritz', 'Special Someone', 'KN Fan' and 'Don Angelo' among the trending topics.